Have you ever be en late for school or work and no one believed your excuse? Wendell and Floyd have the worst luck. The first day they go to school, they are nearly captured by space creatures. Their teacher doesn’t believe them. The second day, pirates are loose in the neighborhood. The teacher does not believe them again. On the third day, there is a plague of frogs. Determined to finally get to school on time, they leave extra early one day and take Wendell’s secret shortcut. This shortcut goes through a thick jungle, quick sand, sleeping crocodiles, a deep gorge and finally a big mud puddle. It’s amazing, but they actually get to school on time, if a little muddy. Their teacher, happy that they’re finally at school on time, decides that maybe she doesn’t really want to know why the boys are all muddy. 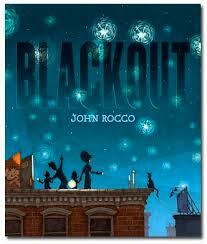 This is a fun read aloud that my second graders really loved. 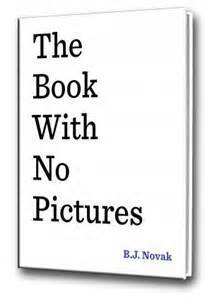 It was a CA Young Readers’ Medal nominee in 2000. 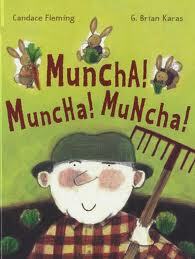 I love it when I find a great book for my preschool and TK students. 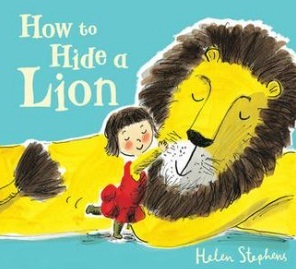 How to Hide a Lion is a sweet book with endearing illustrations. Lion comes to town looking for a hat. Everyone is scared of him, so he runs away. He ends up in the backyard of a strong and very brave girl named Iris. Iris finds Lion in her playhouse. Lion is much too big to hide in her playhouse. So, Iris takes him inside her house. First, she grooms him and puts a bandage on his hurt paw. Then, she tries to hide him. Iris succeeds for a while, but while reading a story to Lion, he falls fast asleep. It happens that lions are very hard to wake up. Lions that are hard to wake up are unable to hide quickly. Needless to say, disaster strikes. Iris’ mom discovers Lion, screams, and Lion is on the run again. He decides to hide in plain site, sitting still, between two statues next to the Town Hall. Unfortunately for two crooks, and fortunately for Iris’ town, Lion’s hiding place is the perfect place to catch crooks leaving the Town Hall with the mayor’s candlesticks. The towns people, no longer scared of Lion, honor him and present him with a …hat. Of course. 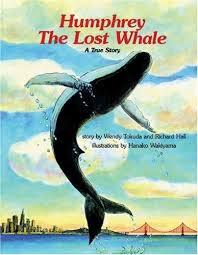 I was charmed by this book as were my students. Please enjoy. 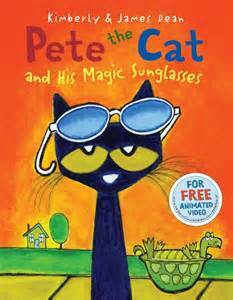 Pete the Cat is one very cool dude. He is a blue cat, and in this book, he is a blue cat with some “cool, blue, magic sunglasses”. Wait and see what magic they can do. Pete is blue, and not just in color. He’s a blue cat who is feeling blue. Pete has “the blue cat blues”. Walking down the street, he runs into Grumpy Toad, a toad that was never happy. Bummer…not the kind of guy you want to run into when you’re feeling blue, yourself. Today, though, Grumpy Toad has a smile on his face. Why? Grumpy Toad has a pair of “cool, blue, magic sunglasses,” that help him “see things in a whole new way.” He gives the glasses to Pete. When Pete puts on the glasses, all of a sudden he sees that, “The birds are singing. The sky is bright. The sun is shining. I’m feeling ALRIGHT!” Pete takes his trusty skateboard and continues on his way in a sunnier mood. What a cool way to talk about times when you’re feeling grumpy, angry, frustrated or just plain blue. I loved it; my kids loved it, and we’re feeling ALRIGHT! So, be cool, and read this great book, too.